Living room is that one place of our homes that we want to keep up to date and stylish so our guests could appreciate its decor. The living room in the above picture is done with one of the most modern interior designs. The complete room is painted in white that is providing a base to other colors in the room. The television case is done with dark brown color same as of the rug on the floor. Dark brown looks very formal on white. The sofa is bringing a bright and happy touch to the completely formal room with its sunshine yellow color and luxurious design. The room has adequate amount of space and looks quite vivid because of the big window and white color. This room carries a formal look of white and dark brown which is interrupted by a happy yellow color. 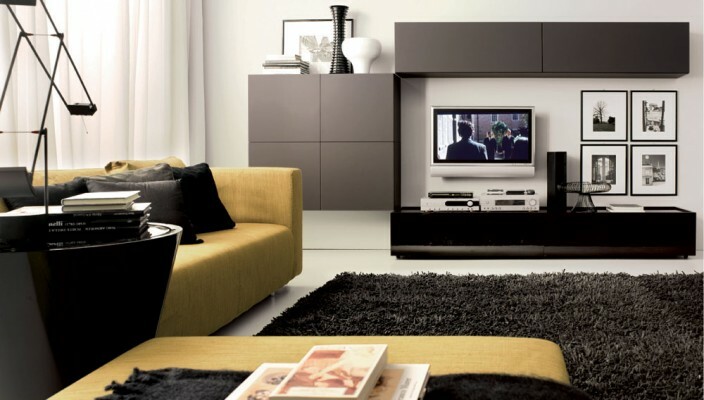 It is an example of modern interior designing in true sense.